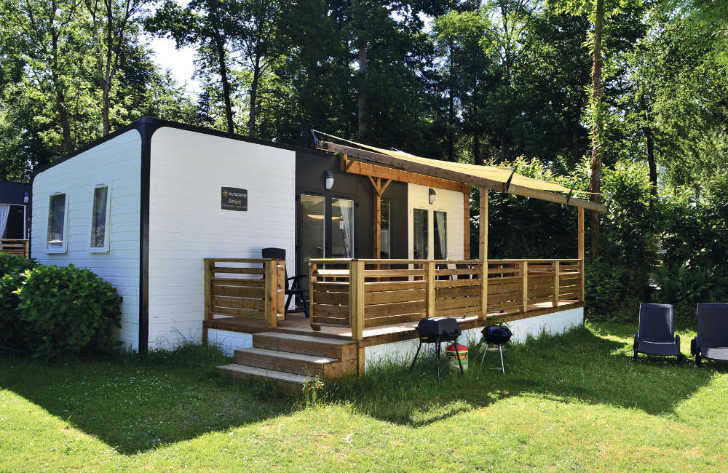 Eurocamp Avant mobile homes were created in response to customer feedback. The main aim is to combine practicality,comfort and space to provide Eurocamp’s next generation mobile homes. Eurocamp have gone all out with modern design on the Avant. As a result there are plenty of clean lines and superb looking furniture. The lounge area is comfortable and stylish and the beds are larger than any other model. The piece de resistance with the Eurocamp Avant is the amount of space. The modern kitchen opens up onto a wonderful decked area which is covered and comes with furniture. This area therefore helps to bring the “outside in” and the “inside out”. As a result you get a real sense of space and the perfect location for some al fresco dining. The Eurocamp Avant comes in two different sizes. Firstly there’s a 2 bedroom model which offers 29m2 of space. This two bedroom model sleeps up to 6 in it’s double and twin rooms. Finally, there’s a 3 bedroom model that is 32m2 in size. Therefore the extra space allows 8 to sleep in it’s double, twin and bunk bed rooms. Both Eurocamp Avant mobile homes are fully equipped with a variety of items such as a large part-covered decked area, a spacious living area with convertible bed. You’ll also find a fully equipped kitchen with an oven, a grill and gas hob, a full size fridge freezer, microwave. A gas or charcoal BBQ are also available free of charge where campsite regulations allow but the thing that sets them apart from other models is the addition of a dishwasher in the kitchen and bluetooth speaker and radio in the lounge. If you love the look of the Eurocamp Avant and would like to find out more simply click the button below or take a look at some of the other holiday accommodation from Eurocamp.